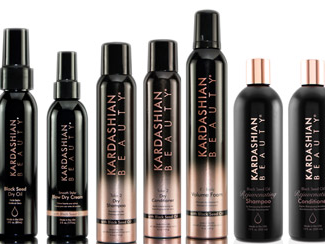 Introducing Kardashian Beauty, a line of hair products infused with the rejuvenating power of Black Seed Oil. This luxurious range of hydrating hair products targets dry, dull and overworked hair to dramatically enhance shine, lustre and body! The highly treasured Black Seed Oil comes from the pressed seeds of the Nigella Sativa, a flowering plant known to thrive in the severely dry conditions of the Mediterranean region. This ancient healing oil is highly rich in essential fatty acids such as omega 6 and omega 3, which help to revitalise and fortify hair. Other nourishing properties such as multiple antioxidants and vitamins enhance hairs overall strength, health and luster for gorgeous, shiny locks! Black Seed Dry Oil is a nutrient rich treatment and styling aid that rejuvenates and nourishes hair so it appears strong, thick, smooth and gloriously shiny. This ultra-light formula is easily absorbed, instantly nourishing and smoothing the hair with no residue left behind. Smooth Styler Blow Dry Cream is a lightweight cream that creates sleek and smooth styles with restored shine. This light-hold moisturising cream with Black Seed Oil eliminates fizz and flyaways while helping hair resist humidity and thermal styling damage, keeping hair chic, smooth and glamorous throughout the day. Take 2 Dry Shampoo instantly refreshes hair and helps to extend the life of your style by absorbing excess oils that weight hair down. This fast drying spray, formulated with Black Seed Oil, restores volume and lift to the hair, added texture to create the perfect base for layered styling and the ultimate glamorous finish. Take 2 Dry Mosturising Dry Conditioner is a lightweight conditioning spray that revives dull or dry hair by adding shine and moisture to second and third day styles. This moisturising formula contains small conditioning molecules that instantly hydrate and smooth your hair, leaving it incredibly soft and irresistibly smooth. Nourishing Black Seed Oil provides added radiance and shine for the ultimate glamorous finish. and smoothes hair, creating lasting body and movement for a fully glamorous finish. Gently cleanses hair of impurities while restoring natural strength and radiance with the luxurious benefits of Black Seed Oil.